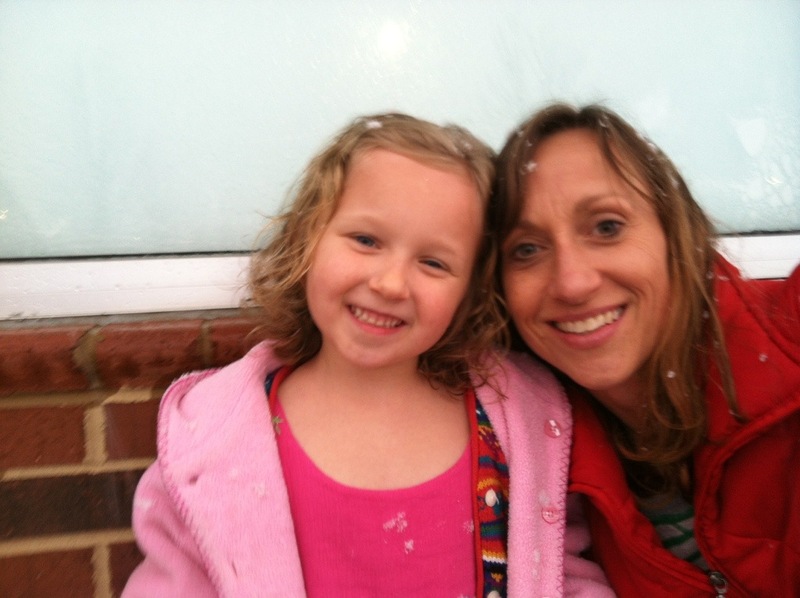 Our time in Virginia ended abruptly at the end of January. We put in our notice with the apartment complex and Tom brought all of our stuff home when he went up for the last time. It wasn’t because of something Tom did. The project just ran out of money. Now Tom is working at Duke Energy here in Charlotte. He is home most nights and enjoys seeing the kids (and his wife) as much as we enjoy seeing him. I has been very nice having Tom home. Yes, I love to see my husband, but it is really, really nice to have someone to share the night time work load with. Tom got up twice last night with two different kids. He also has a magical way of putting Miller back to sleep when Miller wakes up too early in the morning. He has been playing “Monster” with the kids each night and they love having him around. Tom’s being home is most noticeable in Wilson. Poor Wilson had a rough year. His Daddy started traveling out of town three weeks before his new baby brother was born. That can’t be an easy transition for anyone. Wilson was so whiny towards the end of the year. I could really tell that he was upset with things but didn’t have the words to tell us how he felt. He is such a happier child now. He whines much less than he did, he obeys more, and is definitely more content. He is so excited to have his Daddy play with him after work each day, read to him each night, and lay with him until he falls asleep. Our family is back together. This entry was posted in Uncategorized on February 28, 2013 by Becca. On Saturday night our whole family went over to Josh and Rachel Bishop’s house for dinner. I really enjoy hanging out with them. They are both so easy to talk to, our kids love each other, and we are all very relaxed about what the kids are doing and how they are behaving. It is great to have friends like them. I have written about Rachel, Peyton and Ava before. They are who we would have four hour long play dates with on a regular basis. Peyton and Wilson love each other because they can be rambunctious boys together. Tonight was no different. The kids had a great time. At one point four of them were in bed together watching a movie. Josh, Rachel and the kids will all be moving to Mumbai, India in June. Josh will be a principal at an Ambassador’s school in Mumbai. It is one of the top ten schools in the world. An opportunity that they have been working towards for many years. I will miss them terribly, but am excited about the opportunity to visit India in the near future. Because they are moving and can’t take much with them, I was given this awesome, antique, Moroccan vase that was in their attic. 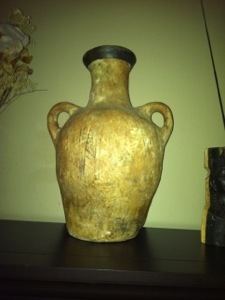 Rachel used to buy and sell Moroccan goods and had a few extra vases laying around (she would). We also received a larger one as well. Pretty cool! What a great friend. This entry was posted in Uncategorized and tagged bishops, Dinner, Peyton on February 24, 2013 by Becca. 1. I am thankful for vaccines. I get the serious ones because I do not want my child to get the measles, whooping cough, polio or meningitis. That would be terrible, even deadly. Many parents get the recommended vaccine schedule without a single problem, and I am thankful. It is each parent’s decision to make and I do not judge any mom’s decision about vaccines. 2. I have been told by the kids’ pediatrician that because of ObamaCare, their office will get less money reimbursed to them from the insurance companies for patients that are not up to date on all required vaccinations by age two. Because of this, if Miller doesn’t have all his required shots in the next six months, I may not be allowed to go to Charlotte Pediatrics anymore. I love my pediatrician and do not want to have to find another one. How would I? Now you can see why I am a little peeved about the rigidity of the vaccination schedule. This is why I am saying that I gave into “The Man” when I brought Miller to have his shot yesterday. I did. I hope this clears up a few things that I talked about yesterday. This entry was posted in Uncategorized on February 23, 2013 by Becca. When Faith was six months old I read “The Vaccine Book” by Dr. Sears. It really opened my eyes to the controversy around vaccines, what is in them, and how many diseases that there are vaccines for. When I was a kid I was vaccinated for less diseases than today. I wasn’t vaccinated for Hep A and B until I was thirty. No one was vaccinated for chicken pox, it was just a right of passage. Now kids are vaccinated for nine illnesses (over 10 shots) in the first two years of life and receive their first Hep B shot in the hospital after being born. This is not for me. My problem with vaccines isn’t the vaccine itself. It is the extras that are in the shots: aluminum, formaldehyde, preservatives, genetically modified cow parts, etc. Gross! I have met numerous moms who swear that the shots made their child autistic. I know that this is a huge controversy right now and the AMA says that it isn’t true, but this isn’t a chance that I am willing to take. My kids will have plenty of time to get all of their shots….even the ones that I find unnecessary, but are required (like chicken pox). As a result, I got into a fight with Faith’s first pediatrician, fired him, and found one that would work with me on a personalized vaccination schedule. Dr. Richter is fabulous! She listens to what I have to say and treats me with respect as a parent who is doing what I believe to be best for my kids. It is obvious that some of the nurses don’t agree with my methodologies, but as long as Dr. Richter does, I am okay. Today I went in to get Miller a vaccination between his check up appointments. I have been promising to do this for over a year, but never seem to have the time or motivation to make an extra trip to the doctor so that my baby can get stabbed with a needle. Not much motivation there. Until they are three years old, my rule is that my kids will get one shot per appointment. I let the doctor decide which vaccinations they will receive. I basically get only the ones for the diseases that they could die from and with today’s “cocktail” shots they still get vaccinated for up to five diseases at one time. So, today I gave in to “The Man” and made the trip to the pediatricians office to get Miller one of his shots. The nurse actually said to me, “I didn’t know which shot you wanted to give him. He needs so many”. I had to chuckle. On a lighter note, Miller is doing awesome! He has two molars on the bottom now and one other small bottom tooth. “Mamma” is his favorite word. He doesn’t always use it properly, but he says it all the time. I love it! When asked a yes or no question he will shake his whole body to answer the question instead of just nodding his head. He is obsessed with utensils and has to have one if someone else does. He can use the drill for the Take Apart Truck and actually unscrew the screws. Brilliant, right?! Unfortunately he has been getting up at 5:30 every morning which is wearing me out! He is still Mamma’s Little Boy and I love him to death! So glad God brought him into our lives. 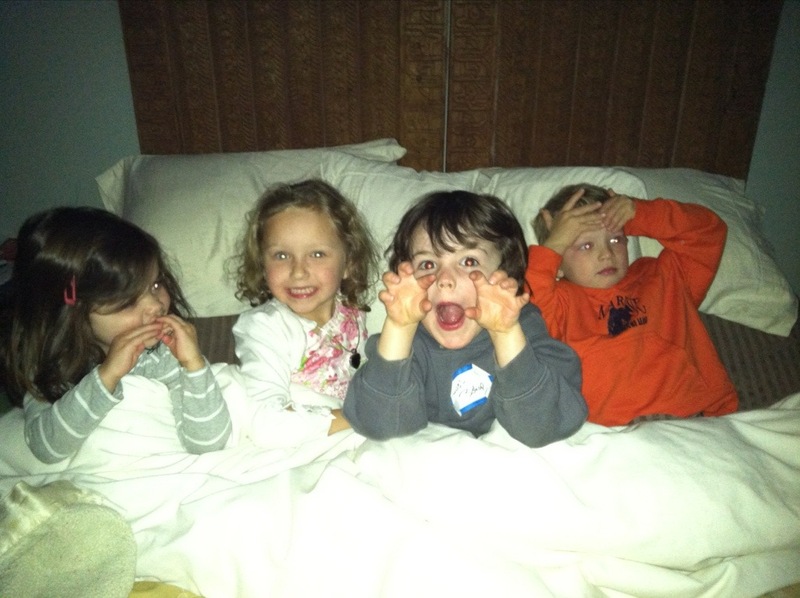 This entry was posted in Uncategorized and tagged Miller, months, vaccine on February 20, 2013 by Becca. 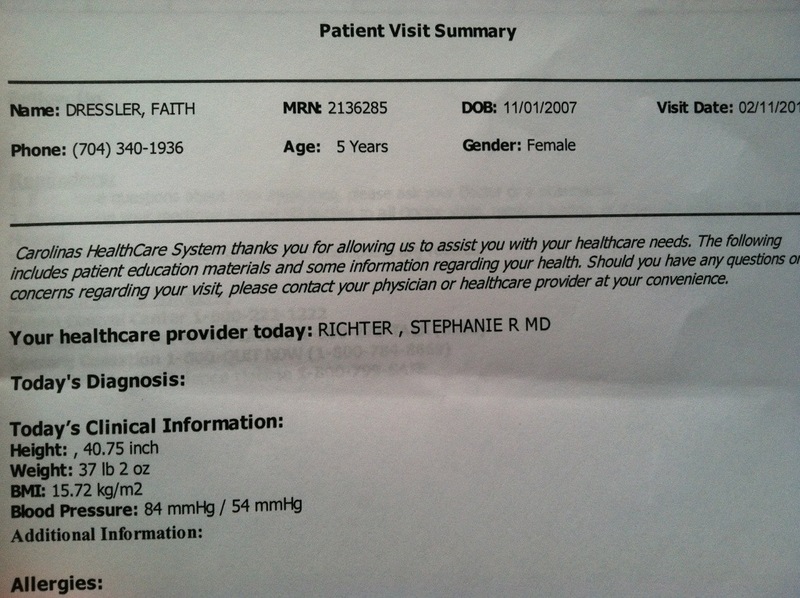 When Faith turned three, I was a few months late getting her to the doctor for her check up. Now she has to wait until a full year has passed before she can have another one. She now has her birthday check up in February. Oh well! It was finally time for her five year old check up. Faith asked me for days before her appointment if she would be getting a shot. She had seen Miller and Wilson get one within the last few months and she was not happy about the prospect of getting one herself. I told her that I wasn’t sure if she was going to get a shot or not, even though I figured she would. On the way to the appointment I explained to her that she would probably be getting a shot. Then I explained that she might even have to get two of them. I told her that she had two choices: she could get both shots today or she could get one shot today and another shot this summer. It was her choice. She maturely decided that she would rather get both shots today and “get it over with”. And she did! She bravely endured two shots in the arm and was very happy to learn that she wouldn’t be getting any more shots until she was 12. This entry was posted in Uncategorized and tagged check up, doctor, Faith, five on February 19, 2013 by Becca. It finally snowed in Charlotte! After two years of waiting patiently, it snowed about an inch in thirty minutes. It was enough for the kids to play in, throw some snowballs, and make everything look beautifully white. Faith and I were out shopping and getting her a haircut. We parked at one end of the parking lot, put her name in at the hair place, and walked to the other end to shop. During this walk I saw some very dark and ominous looking clouds heading our way. By the time we left the store it was a total blizzard outside. I had to carry Faith, carry the groceries, and walk as fast as I could to the car, which was about 100 yards away. She and I laughed so hard at ourselves. The wind was whipping, snow was getting us soaked and we continued to laugh and walk. It was great! Here are Faith and I after her haircut with snow in our hair. 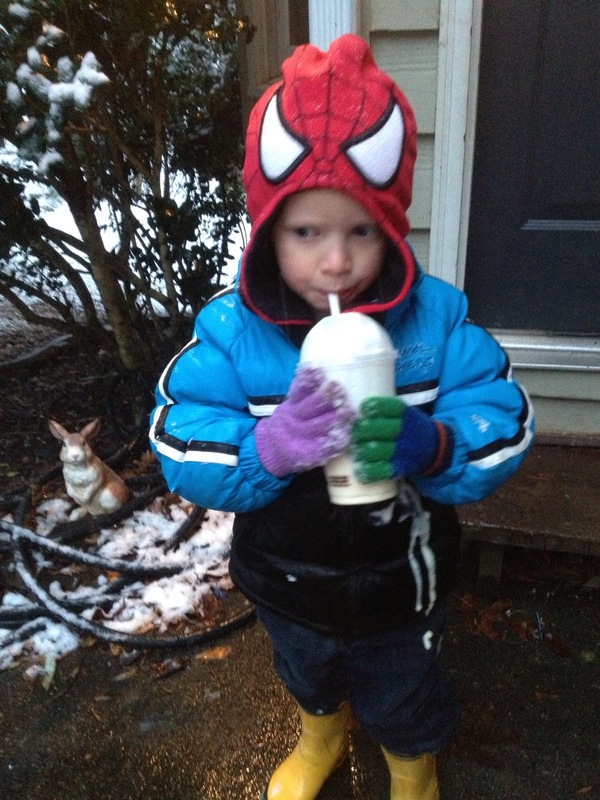 We threw snowballs in the front yard and drank the milk shakes that Faith and I brought home as a surprise….milkshakes during a snow storm….I know, unusual. Wilson was too young to even remember the last time it snowed. Faith’s new, shorter haircut. After much complaining about how it hurt to brush her hair, she decided that cutting it was the best solution. 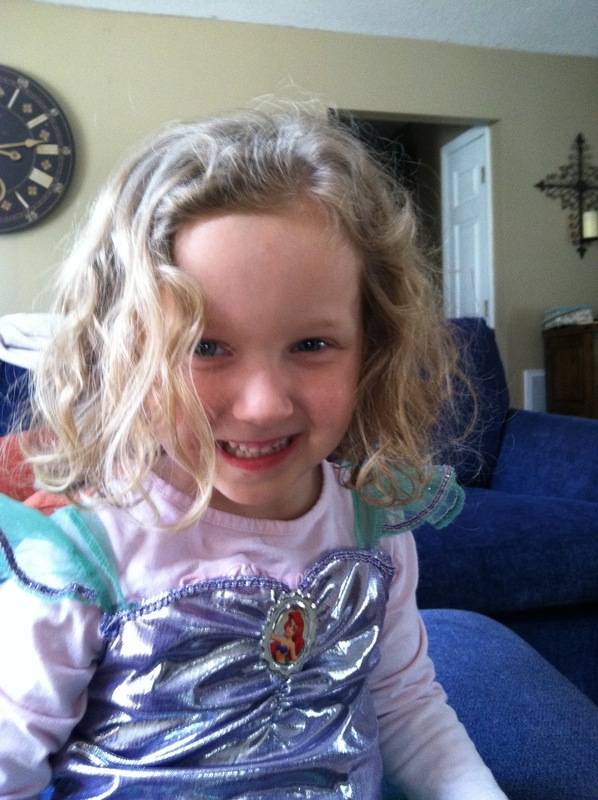 Her hair is so curly that it was nearly impossible to brush out in the morning. A very mature decision! 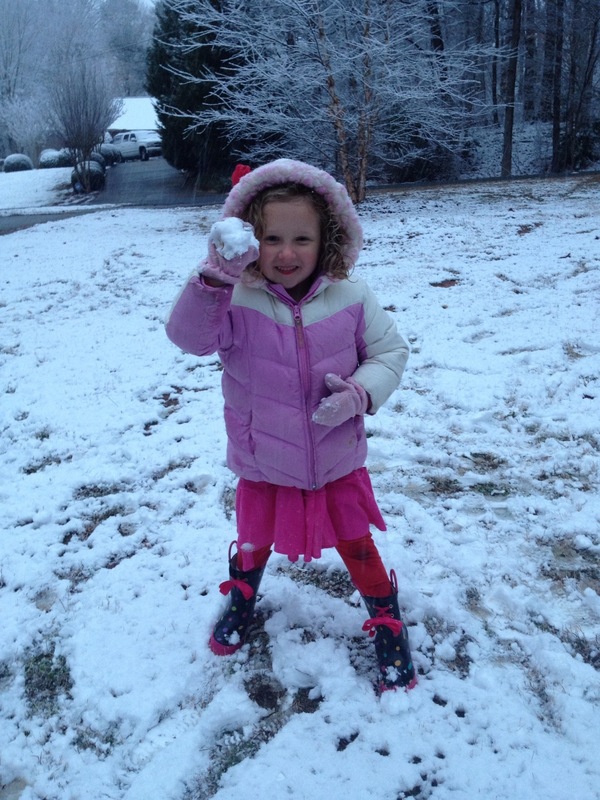 This entry was posted in Uncategorized and tagged charlotte, Faith, haircut, snow on February 17, 2013 by Becca. I love a good project. I don’t think I am happy unless I have one. Raising three kids and keeping house is not considered a project in my book. A project has to challenge me and it has to make the house look better. In the past six years I have painted almost every room in the house, I have painted the trim twice, I have moved or replaced six light fixtures, decorated Faith’s room, installed smoke detectors, and rearranged more furniture than I care to recall. I still have a long list of things that I want to do: install laminate flooring downstairs, put in track lighting, rip up the carpeting on the stairs and refinish the wood underneath, and set up a sitting room. I think that this “project” addiction is an inherited gene. My mom is a total handy woman with a constant list. She comes by this naturally from her parents. I have no where near her abilities in handiness, but I am learning and trying. To me, it is fun. I now subscribe to DIY magazine which is making my “to do” list even longer. Fun, fun, fun! It drives Tom nuts sometimes. He tells me that I have to finish one project before I can start another. Last time he gave me that challenge I finished three in one weekend just so I could start the one I wanted. In a drunken moment I got him to agree to letting me refinishing the stairs, although I am not sure I can really do it right. He doesn’t have to help me. He just has to tolerate the clutter until it is finished. I always finish and it always looks better than it did. 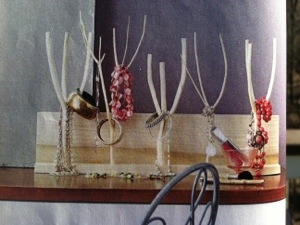 Today I did a simple project from my DIY magazine – a jewelry holder made out of tree branches. Easy. I collected my branches on a walk with the kids. I used a 1 x 4 that I bought at Home Depot for the base and then I used the drill to make the holes in the base. The one in the magazine sits on the dresser but I want mine to hang on the wall. 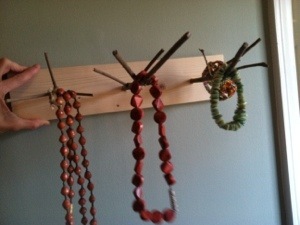 This will allow the necklaces to dangle instead of tangle. :). Here is mine. It actually looks better in person. Where did they get the perfectly pronged, white wood? Oh well, made with love. 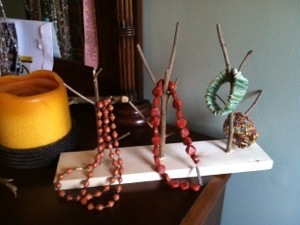 This entry was posted in Uncategorized and tagged necklace, projects on February 16, 2013 by Becca.